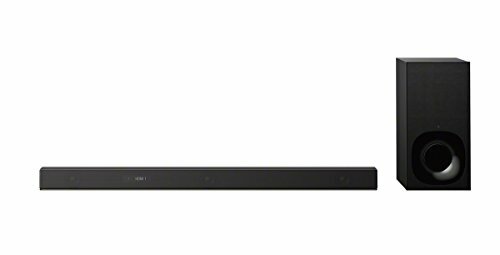 The Sony HT-ZF9 is a compact and very well-made 3.1-channel soundbar that not only supports Dolby Atmos and DTS:X, but creates 7.1.2 surround sound, thanks to some clever psychoacoustics. It isn’t as genuinely immersive as some of the competition, but a decent set of features and a great price help even things out. The Sony HT-ZF9 takes a very different approach to delivering Dolby Atmos and DTS:X. This compact 3.1-channel sounder eschews the usual side- and upward-firing drivers, instead relying on clever digital signal processing to create the illusion of greater immersion. Sony claims that the ZF9 can deliver a virtual 7.1.2 surround sound experience, thanks to its proprietary Vertical Surround Engine. That's a fairly bold claim, especially when compared to competing soundbars like the LG SK10Y. At £649 the Sony is certainly cheaper than the competition, and there's a decent set of features that includes 4K HDR and Hi-Res Audio support, along with built-in WiFi, Bluetooth, and Chromecast. The real question is: does Sony's psychoacoustic trickery actually work? The Sony HT-ZF9 sports a fairly simple design, with the emphasis on minimalism and build quality. As a result the soundbar is quite discreet and comes in black with a two-tone effect, thanks to a combination of matte and brushed metal finishes. The ZF9 has a removable cloth grille, behind which you'll find the three speakers: front left, front right and centre. With the grille removed there's an ugly lip along the bottom of soundbar, making it look rather industrial, so we'd leave it on. There's a display between the left and centre drivers, which is clearly visible even with the grille attached. The soundbar is fairly compact at a metre wide, making it ideal for the majority of TV sizes, and at only 64mm high it shouldn't block most screens, even the low-slung ones. The Sony HT-ZF9 boasts an impressive set of features, headlined by support for the two main immersive audio formats: Dolby Atmos and DTS:X. This makes it relatively unusual amongst soundbars, with surprisingly few actually supporting both versions. The soundbar can upscale non-object-based audio, too, taking advantage of all its virtual channels, as well as offer a number of sound modes, including Cinema, Game Studio, Music, News, and Sports. Since the ZF9 is a 3.1-channel system, the soundbar is partnered with a wireless active subwoofer that is ported and uses a forward-firing 160mm paper driver. The soundbar and sub should pair automatically, although if necessary this can also be performed manually. The combined system has a claimed power output of 400W. Although Sony is keen to emphasise the immersive nature of the ZF9's virtual processing, the manufacturer also offers an optional wireless rear speaker kit. The SA-Z9R speakers aren't cheap at £299, but they do allow you to upgrade the ZF9 into a genuine 5.1-channel system. The soundbar's audio credentials are further enhanced by the inclusion of Sony's Music Center app, which allows you to group compatible speakers and stream music around the house. There's also integrated Spotify, built-in Chromecast, and the soundbar even works with Google Assistant. The Sony HT-ZF9 houses all its connections in a recessed area at the rear of the soundbar. This area has a rather unnecessary angled shape, which actually makes attaching the HDMI cables tricky. There are two HDMI inputs and an HDMI output that supports ARC (Audio Return Channel), and they all support 4K/60p, Wide Colour Gamut, High Dynamic Range (HDR10, Hybrid Log-Gamma and Dolby Vision), and HDCP 2.2. There's also an optical digital audio input and a 3.5mm analogue audio input to handle audio. In terms of control, there are a few simple touch-sensitive options on the soundbar itself for power, input, Bluetooth, music service and volume. An included remote is decidedly more complicated than we're used to seeing with a soundbar, reflecting the fact that the ZF9 does quite a lot. This full-function zapper fits comfortably in the hand but is fairly busy in terms of its layout, offering a bewildering array of control choices. However, once used to the controller you realise that there is a logic to the layout, with a central navigation dial, volume controls, direct access to the various inputs, and a selection of different sound modes. You can also select the home page, turn the Vertical Surround Engine on, play back music, adjust the sub level, and even trim the level of the rear speakers if you've added the optional wireless surround kit. There's also Sony's Music Center app, which allows you to control the ZF9 using a smart device. The app is well-designed, intuitively laid out, and gives you access to most of the menu functions via an easy-to-follow user interface. Setting up the Sony HT-ZF9 is fairly straightforward, although just like the remote there are a number of options that might seem confusing at first. However if you methodically work your way through the settings menu, everything should be fairly intuitive. It's also really nice to find a soundbar with actual onscreen menus, rather than having to scroll through a tiny display. There's no automated calibration feature, so once you have placed the soundbar in front of the TV and positioned the subwoofer off to the side, all you need to do is set the distance and levels for the 'bar and the sub. There are test tones available, allowing you to set the levels using an SPL meter and ensuring the sound field is balanced (there are plenty of free SPL apps available). The Sony has a home page that offers three options: Watch, Listen, and Setup. As the name suggests, Watch provides access to the video sources like ARC, HDMI 1 and HDMI 1; Listen gives you access to the audio sources like Bluetooth, USB, Analogue, and Spotify; you can also access all the inputs using the provided remote or Sony's Music Centre app. The success of the Sony HT-ZF9 depends entirely on the effectiveness of the Vertical Surround Engine. This surround processing does work to a degree, but not quite as well as soundbars that take a more traditional approach (i.e. ones with more speakers). Regardless of the type of content that you're watching, Sony provides plenty of sonic alternatives. There's a host of aural presets that are designed to work best with different content. Cinema creates a bigger experience for movies; Game Studio is designed to enhance gaming; Sports setting emphasises the crowd noises; News concentrates on dialogue; Standard avoids processing; while Auto Sound lets the ZF9 choose the most appropriate preset for any particular incoming signal. If you fancy upmixing conventional soundtracks, then you can use the 'Vertical S' button on the remote control. This engages the Vertical Surround Engine (VSE), which then processes non-object-based soundtracks to make them more immersive. If the content is in Dolby Atmos or DTS:X, VSE selection is automatic. When watching the opening fight in Guardians of the Galaxy Vol.2, there's no doubt the on-screen soundstage feels audibly expanded. The VSE processor decodes the Dolby Atmos soundtrack, placing effects further out to the left and right, while adding a greater sense of height to the audio. DTS:X is just as impressive; watching King Kong gave an added sense of space to the jungle scenes. However there's only so much that psychoacoustic trickery can do to fool the ears into thinking that sounds are emanating from locations where you know there aren't any speakers. The virtual processing works very well with most soundtracks, but very directional mixes sees the results less assured. Gravity just doesn't sound the same as it would on a genuine 5.1.4 system: the sounds that are supposed to move around the room instead just moved around in front of the screen. The ZF9 is certified for Hi-Res Audio and supports stacks of audio formats. Sony has also included its Digital Sound Enhancement Engine, which is intended to get the best out of lower resolution music files. The soundbar is adept at handling music, thanks in no small part to the quality of its front three speakers. What really stands out is the clarity, with plenty of detail and some excellent stereo imaging. The mid-range is nicely defined, the higher registers are extremely well reproduced, and the bass is tight and solid. As a result, music sounds impressive regardless of your tastes. We threw an eclectic mix at the ZF9 and it rendered each track with precision. The Sony HT-ZF9 has a lot to recommend, and Sony's application of digital signal processing to create a virtual immersive experience is often very successful. The fact that the soundbar actually supports both Dolby Atmos and DTS:X is a major feather in its cap, and this compact and well-made soundbar boasts plenty of other useful features. Crucially the ZF9 sounds very good with both movies and music, and its support of Hi-Res Audio adds to the soundbar's aural credentials. However, this Sony can't compete with soundbars that deliver immersive audio in a more traditional fashion, but as the ZF9 is cheaper it'll be better suited to smaller rooms or those that don't lend themselves to reflected sounds. At about the same price, the Bose can deliver an open soundstage while also retaining plenty of detail and clarity. There's a decent set of features as well, including SoundTouch multiroom and Alexa voice control. However, the bass performance is slightly lacking, and although you do have the option of adding a subwoofer, that will increase the cost. Another great compact performer at a lower price. It sounds much bigger than it looks, and can make your living room smarter thanks to an open approach to app choices and voice-assistant integration.